Cordierite (2350ºF Plates, Discs, Posts, Kiln Furniture, and Custom Shapes) - Foundry Service & Supplies, Inc.
Foundry Services kiln furniture is manufactured using superior quality body formulations, well regulated production and quality control procedures, and an exceptionally long and tightly controlled firing cycle. 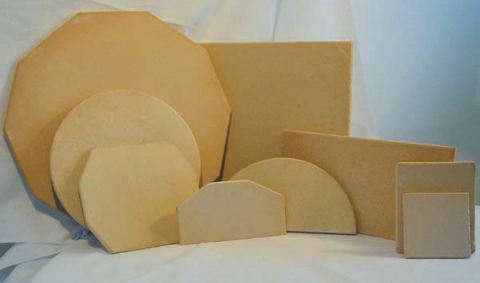 These procedures result in a finished product composed of 50% Cordierite and 35% Mullite, with lesser amounts of corundum and other combined mineralogical forms. Glassy phase and uncombined minerals are found in very minor or trace amounts. 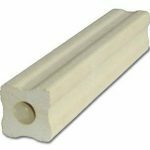 This combination of high Cordierite and high Mullite yields excellent mechanical properties and remarkably high resistance to thermal shock and warping. 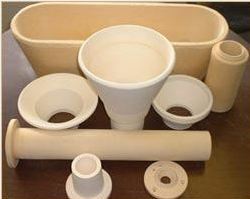 Foundry Services Cordierite is compatible with all makes and models of hobby and Industrial kilns. 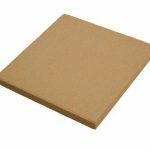 We offer over 200 stock sizes in thicknesses of 1/4″ to 1-1/2″ and in square, rectangular, round, half round, hexagon, and octagon shapes. 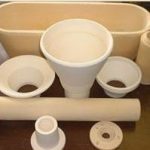 Our 5/8″ thick shelves are recommended up to cone 5, while our 1″ thick shelves are used in the cone 5 to 10 range, often substituting for more costly silicon carbide or high alumina shelves at these temperatures. 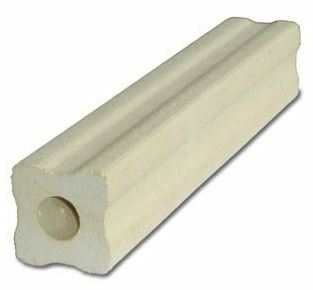 Other Cordierite shapes are also available including posts, racks, tubes, and custom molded parts. 5/8 inch thick shelf. 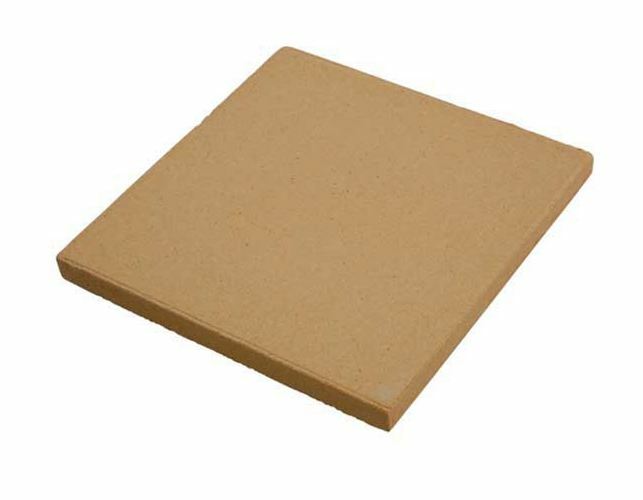 The 1/2, 3/8, or 1/4 inch shelves can be used at low temperatures. 1 inch thick shelf. Some users report that the 5/8 inch shelf works well in electric kilns to cone 10. Shelving is not normally recommended for use above cone 10. However, many users report excellent results when the shelf is flipped regularly. 1-1/2 inch thick decking tile is recommended. P-1 pusher shelf is recommended. Corundum and other converted minerals make up the balance. Glassy phase and unconverted minerals present in trace amounts only. Figures confirmed by X-Ray analysis of two independent laboratories.